Now this bestselling novel is available in audio. Please enjoy this sample! Here’s a sneak peek from this #1 Bestselling novel! Jordan Burke checked his watch as he walked from his office in downtown Chicago to the lunch meeting that would start in ten minutes. The billionaire owner of Burke Enterprises could have taken the company limo, but walking was faster in the midday traffic and it was a good excuse for him to get some exercise. He quickened his pace only to be held up by a red hand signal at the stop light. He tapped his foot impatiently as he waited for the light to change. Jordan straightened and then turned at the sound of the nickname that his sister, Lexi, still called him. A woman with dark hair pulled back in a ponytail tugged on the leash of two dogs that were fast approaching him. The border collie stayed alert at her side, but the larger golden doodle tugged on the leash, following his nose toward Jordan. “Jordy. Heel.” The dog hesitated, glanced at the woman, and then nosed against Jordan’s hand. “I’m sorry. This one’s in training.” She tugged on the leash again. Jordan laughed again and felt some of the tightness in his shoulders ease up. He patted Jordy’s head, noting that his namesake had a curly golden coat that was well-groomed. Jordan’s heart did something funny when he noticed her cheeks flush. It almost felt like it’d skipped a beat. He took a step closer to Maddie. She had a dimple in her left cheek and a small nose with a light smattering of freckles. “You must be good at your job then. 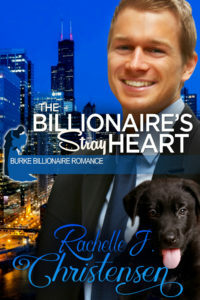 Lucky guy.” He rubbed behind the dog’s ears, forcing himself to look away from the sparkle in Maddie’s eyes. “Thank you.” The border collie shifted his weight back and forth and looked up at Maddie. The street signal began chirping, and Jordan looked up to see the walk signal. “Well, good luck with those two.” He lifted his hand in a wave and hurried across the street. Once his feet hit the sidewalk again, he hesitated, looking back once. Maddie had turned toward the park and for a moment Jordan wished he’d asked her for her phone number. He shrugged. Who was he kidding? He didn’t have time to date. He glanced at his watch again and frowned. The old Jordy might not have worried about being late to a lunch meeting if it meant getting the number of a pretty girl, but that guy had been replaced by the new and improved version. Jordan Burke was a man of business.